central states Archives - davidbix.com - David Bixenspan & The Bix Show. Sean Wheelock, the voice of Bellator MMA, joins the show to talk about growing up as a wrestling fan in Kansas City in the ’80s, including seeing Ric Flair’s first NWA World Heavyweight Title win live at Memorial Hall. We also talk about MMA, including topics related to “Is This Legal,” his book with Art Davie about the creation of the UFC, as well as intersecting topics like the effects of the death of kayfabe on pro wrestling, shoots and double crosses, what pro wrestling moves work in reality, and more. Sean is a lot of fun and I can’t wait to have him back on. Also make sure to check out Let’s Get it On, his podcast with the dean of MMA referees, “Big” John McCarthy. P.S. I know some listeners aren’t big MMA fans, but there’s a good bit of wrestling content first and most of the MMA content here has pro wrestling overlap. For a direct download link, click here. If you enjoy the show, please consider using my Amazon Associates link and/or donating to my Patreon, both of which are also handily linked in the top menu of davidbix.com. If you’d like to donate on a one-time basis, you can use the PayPal donation button in the right sidebar. Follow me on Twitter at @davidbix. To subscribe, go to my iTunes podcast listing or use my Feedburner feed to subscribe in all other podcast catchers. 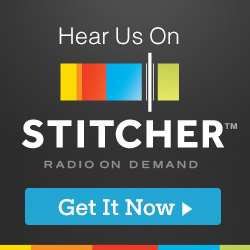 The show is also available for streaming on Stitcher Radio, as well. Please take a moment to leave a positive review on iTunes and/or Stitcher if you enjoy the show.